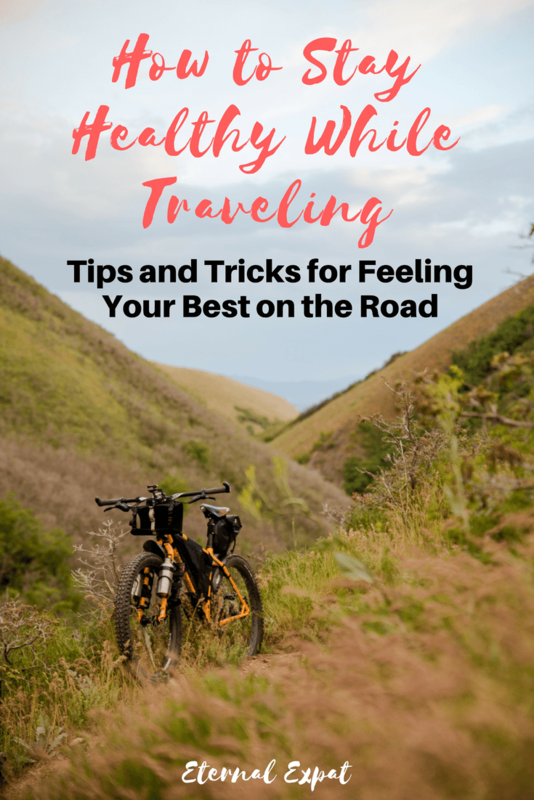 Staying healthy while traveling can be SO difficult. 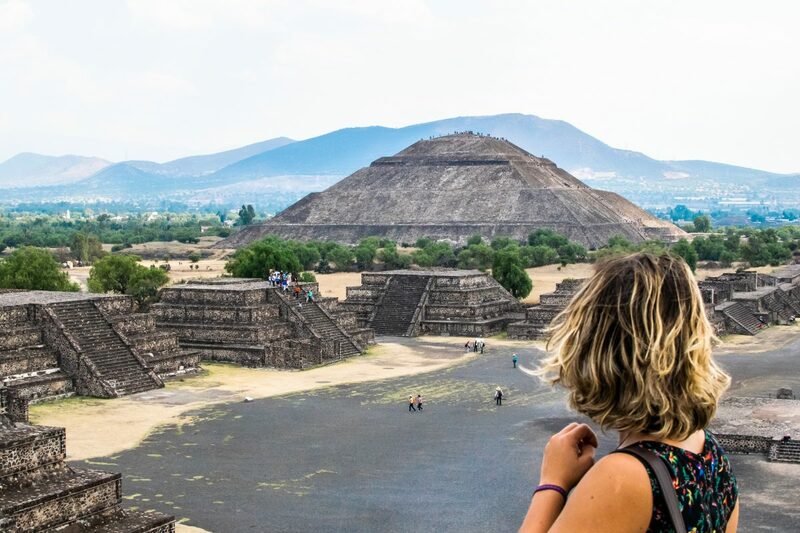 You want to try all of the different foods, enjoy a few bevies every night, and still fit into the cute travel outfits that you packed by the end of the trip. When I traveled around Asia for five months, I actually LOST WEIGHT! I know, insanity. The thing is, when you travel through a place like Thailand or Cambodia or Vietnam and you pack a ton of adventure activities into your day plus miles and miles of walking, you burn a TON of calories. I wasn’t really watching what I was eating. I was indulging in street food, barbecued meats, fried rice and noodles, lots of mango sticky rice, and plenty of ice cold beers. And yet when I got home, I was the thinnest I’ve ever been. I’m not advocating that you should travel to lose weight or saying that if you travel then you’ll definitely lose weight or even be healthy at all. In fact, when I got back I wasn’t very fit, even though I was skinnier. I had lost a ton of muscle and when I went for my first run after five months I just about made it for 5 minutes before breaking back into a walk. Travel is tough on the body, whether you’re going to be super active or not. It doesn’t matter if you’re going away for a long weekend or a round-the-world trip. Since that Asia trip, I’ve learned to be a bit more balanced. I’ve learned how to take better care of my body so that I don’t lose my fitness, but I still get to indulge in plenty of delicious eats along the way. It’s about finding balance and figuring out what works best for you and the way that you like to travel. No need to wear a pair of running sneakers for your whole trip (unless that’s your style, in which case, go for it!). I highly recommend finding a pair of shoes that fit your style, but that is still incredibly comfortable. There’s no way you’re going to opt for walking over trams and buses if your feet are killing you! I am a huge fan of Rainbow Flip Flops. They are cute, come in different colors, and they are the most comfortable flip flops I’ve ever worn. I wore mine all throughout South East Asia – they were perfect for the hot weather and beach days, but also for exploring the cities. You are constantly slipping your shoes off in Asia for entering shops, temples, and hotel rooms, so flip flops tend to be the most practical, too. If you’re going to be traveling around Europe during the summer months, Salt-Water Sandals are some of my favorites. They come in different colors and are more stylish than a pair of flip-flops. They have a sturdy sole and are super comfortable to walk in. This is all to say that you should be walking a ton when you’re traveling. This is the easiest way to stay fit while also being a fun way to sightsee. You miss so much when you hop on the metro or grab a taxi between two destinations. Instead, map it out on your phone (maps.me is my favorite app for offline navigation) and get walking. You’re on vacation, what’s the rush? 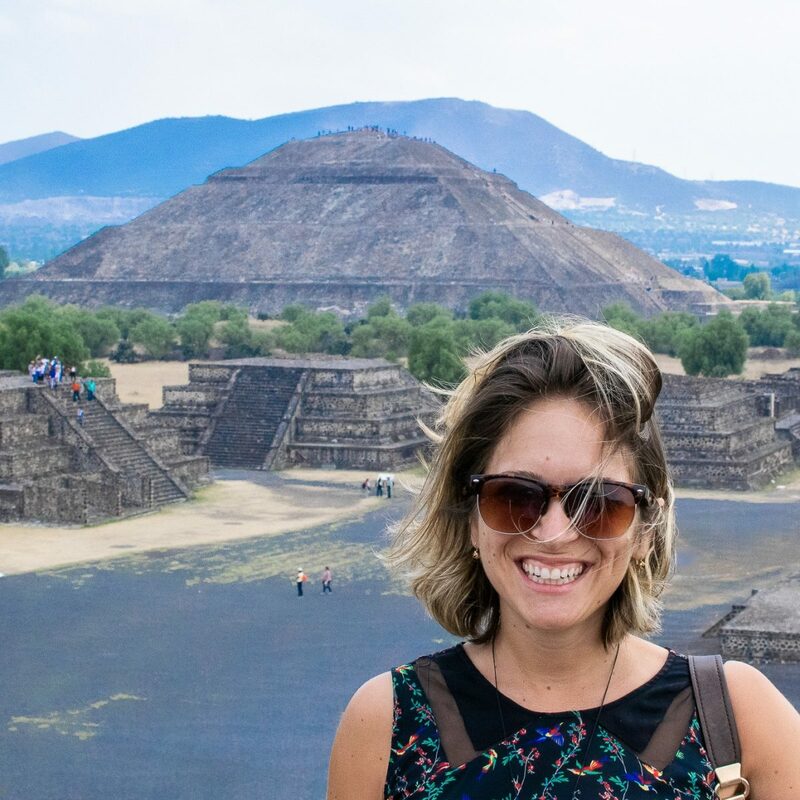 I got plenty of exercise climbing up the steps at the pyramids of Teotihuacan! If you don’t feel super-motivated to walk, I recommend downloading an app that tracks your steps. These days, a ton of people have trackers like Fitbit, but if you don’t there’s a free way to track your steps while you’re on the road. You’ll be shocked at how many calories you’re burning when you’re not sitting at a desk all day (I know I usually am!). My favorite app for tracking steps is Stepwise. You can enter your height and weight and even your stride length to properly monitor how much you’re walking and how many calories you’re burning. It also allows you to compare it to your previous months, so you can see how much more you exercise compared to when you’re home. I love going out for a day of exploring and then when I get back to my hotel or Airbnb, checking how much I walked. Obviously, in order to track your steps using an app, you’ll have to have your phone with you. 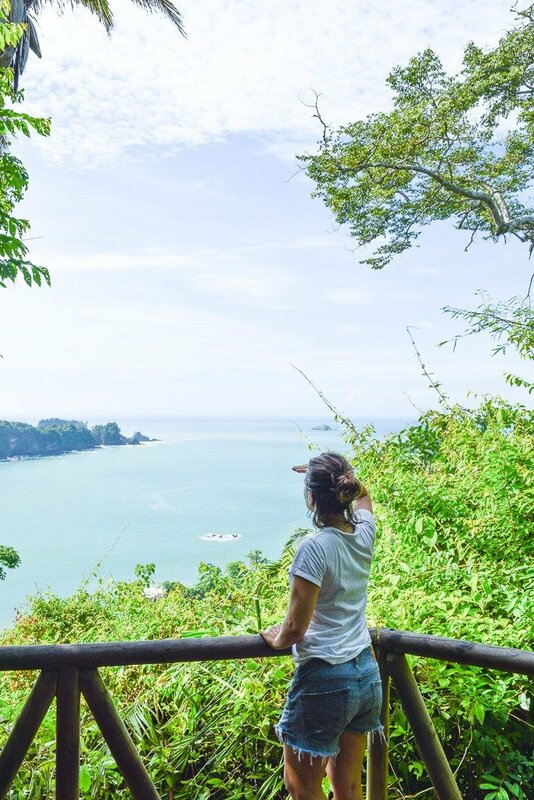 Sweating up a storm after hiking through Manuel Antonio National Park in Costa Rica! Keeping hydrated is probably my number one tip for feeling and looking your best before, during, and after a trip. If you’ve read my advice for avoiding jet lag, you’ll know how much I value a bit of H2O. Drinking water while you’re traveling is a great way to avoid bloating. You’ll no doubt be indulging in plenty of salty snacks while you’re traveling (or beer or wine or Prosecco), so you’ll need to up your water intake. If you’re doing more exercise than you usually do, you’ll want to keep hydrated to avoid headaches or any feelings of drowsiness. If you’re going to be doing a lot of adventure activities – hiking, swimming, kayaking, climbing, etc etc, then you’ll really need to stay hydrated. If you’re even a little bit dehydrated, you’ll feel sluggish and won’t be able to enjoy all of the fun to its full potential. If you can, try to avoid buying tons of plastic water bottles along your travels. While it’s convenient, the amount of waste it produces if every single traveler does it, is astounding. Especially in countries that are still working on what to do with all of this waste. My go-to water bottle when I’m in a country where you can’t drink the water is a LifeStraw Bottle. They’re big enough to fit 650ml of water, you can refill them pretty much anywhere, and they filter out all of the nastiness as you drink the water. I have used it all over Mexico and Costa Rica and never had a problem. Buy a Lifestraw Go Bottle here $30. If you are traveling in countries where you can drink the tap water, I recommend either a Nalgene bottle or a HydroFlask. Both come in different sizes and are incredibly durable. 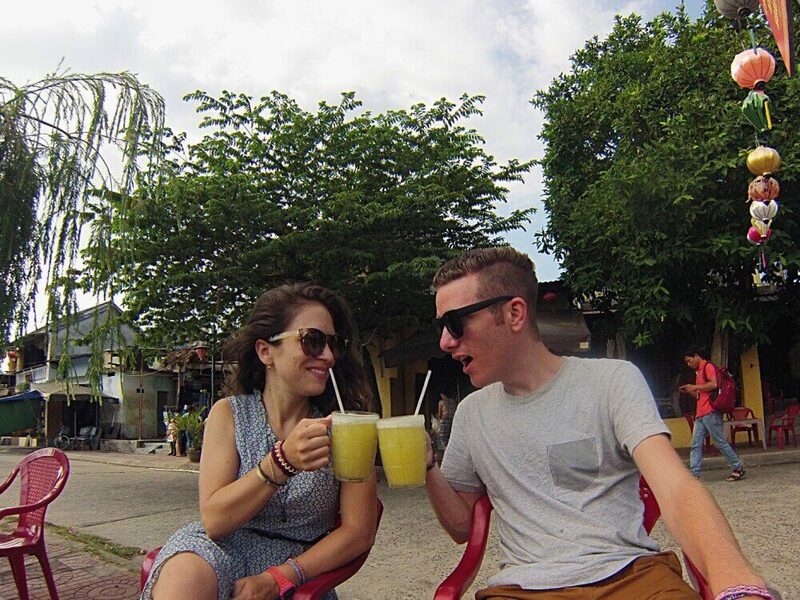 Does freshly squeezed sugar cane juice count as stying hydrated? This should be EASY! Pack in as many fruits as you can in the morning. Unless you’re in Paris and you need to eat all the croissants for breakfast, breakfast is usually a non-event that means you can self-cater. I usually head to the grocery store or nearby farmer’s markets if they exist in the area and load up on whatever fruits are in season. If the place I’m staying has a blender, I’ll have a smoothie. If not, I’ll just cut up the fruit to enjoy with a cup of coffee. Fruit not only keeps you extra hydrated, but it also has a ton of fiber, so it keeps things moving and helps with the absorption of the other nutrients you’ll hopefully be eating. There’s no reason to avoid all of the greasy and carbolicious foods on offer in the country that you’re visiting. If you’re like me, food is one of the true joys of visiting a new country or city and I don’t want to miss out on that, but it’s about finding a balance. If you’re mostly going to be eating out while you’re traveling, getting enough green veggies into your day can be a serious struggle. I know that here in Mexico it can be hard to get much more than onions and cilantro to top off your meal. I usually try to add in any vegetables that I can (without sacrificing the flavor of the meal). For instance, here in Mexico, I might also have some nopales or cooked cactus. When I was in South East Asia, it was easier to get veggies added to different stir-frys or soups. The same goes for traveling around Europe – opt for a side salad with your meal or a side of cooked vegetables just to make sure you’re getting enough vitamins to keep you healthy and your belly happy throughout your trip. 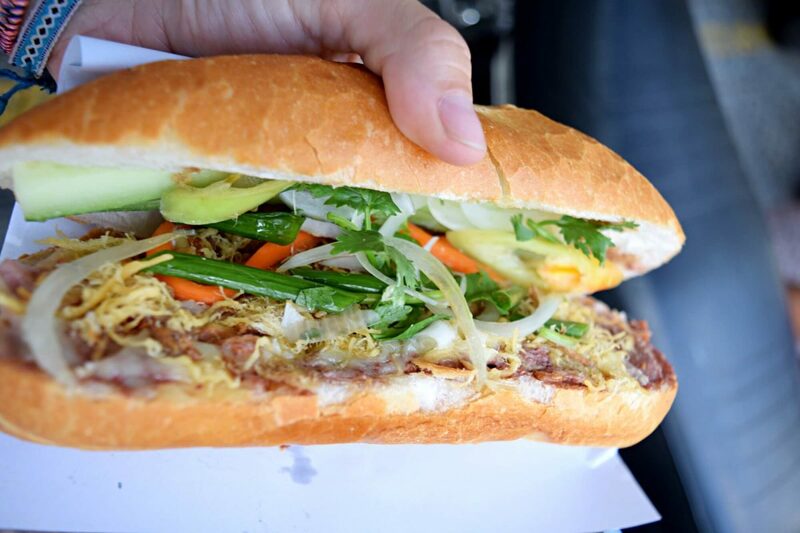 This Banh Mi may have had a ton of fatty meat in it, but look, green stuff! There is NOTHING worse than getting hangry (hungry-angry) when you’re traveling. I have lost count of how many times an argument or meltdown has ensued when either Luke or I are way past hungry. This is also when you end up walking into a 7-11 and buying ice cream or chips or a soda because all-the-sugar-is-needed-right-now. I usually pick up a few really health paleo or vegan sort of snack bars when I’m in the UK or the US. I opt for these because they usually only contain real, whole food ingredients. My favorites in the UK are Nakd bars. They are SO good and you can buy them by the box, so you can always have a few in your purse. In the US, Rx Bars are great. They have minimal ingredients but are slightly more expensive than your average granola bar. Even better, keep a banana or some clementines in your bag (or other fruits with their own skin that are easy to carry around all day). When you get hungry, but you’re nowhere near where you want to eat your next meal, no one suffers. 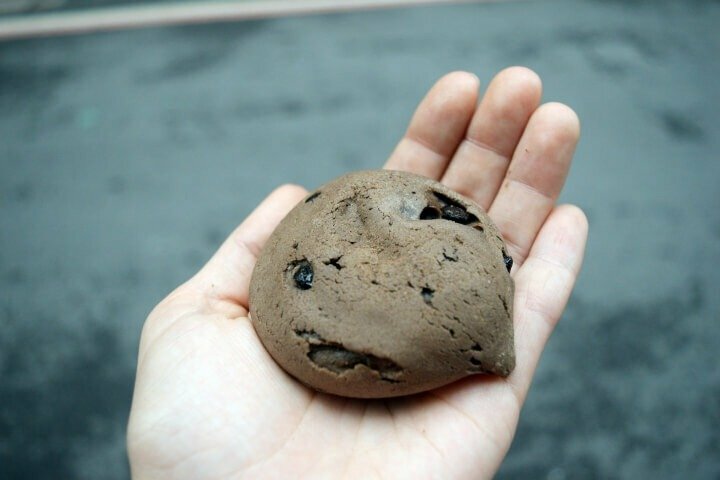 Chocolate chip mochi cookies are what happens when you don’t have healthy snacks on hand (don’t regret it one bit). Have enough space in your accommodation or is there a gym in the hotel? My absolute favorite way to spice up workouts whether I’m at home or on the road is to find a fun YouTube workout. It’s where I find good yoga videos, pilates lessons, HIIT workouts, or just some random bodyweight workouts. I usually do these in the morning if I know I’m not going to be doing any other exercise during the day. If I’m on an active vacation, I very rarely do specific workouts like this because I know I’ll be getting plenty of exercise without even trying. However, if I’m on a chill vacation by the beach or in a city where I’m not doing much walking, I might do a workout every other day just to keep active and fit. You can easily do these if you’ve brought a laptop, if not I usually just use my phone to stream a workout and prop it up against a few books or the wall, depending on where I am working out. 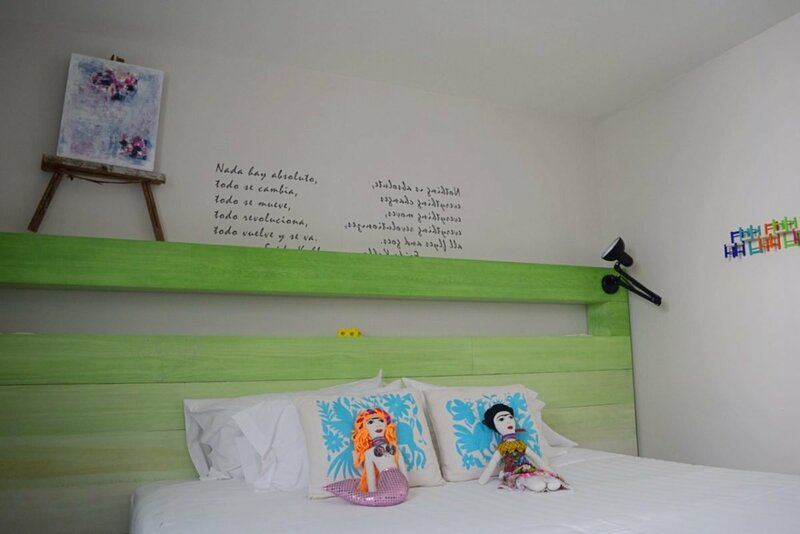 I had a seriously good night’s sleep at this hotel in Mexico City (called La Palomilla). They also served a nice healthy breakfast made fresh with tons of fruit and freshly squeezed juice! If you’re going to try to stay healthy on your holiday, do tons of adventure activities, keep yourself going all day long, and not come home with a cold, then getting enough sleep is a must. This is one of the hardest things for me because I love packing my days full, including a few drinks at a fun bar after dark. This means I don’t usually get back to my hotel or Airbnb until midnight or later and then, of course, I want to get an early start to see more! This usually leads to me feeling totally sluggish and exhausted by day three of my trip and I end up burning out or skipping things that I wanted to see because I’m just so exhausted. So what I recommend is scheduling your days so that you either get to bed early or you get to sleep in a little bit. I’ve found that the latter usually works best for me. I get to stay out and enjoy the evenings and then sleep until about 8:30 or 9am. It means, once I have some coffee, shower, and get ready to head out, it’s about 10:30 or 11am. Some people might think that’s too late to start touring, in which case, I highly recommend trying to get to bed by about 10:30, 11pm the latest. 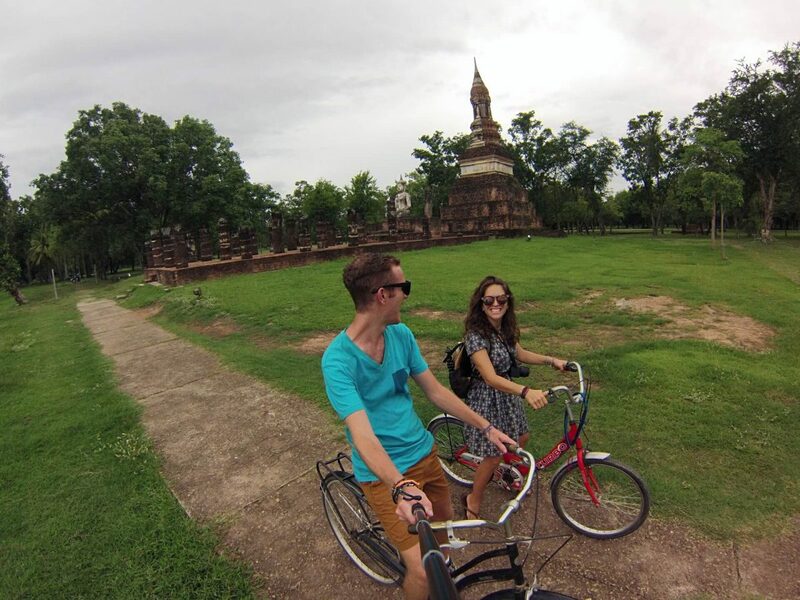 Maybe you can ride a bike instead of taking a car like we did in Thailand. One of my biggest pieces of advice for staying active and healthy while you’re traveling is just to get out there and see the country. Walk in the countryside, get out in nature, hike, swim, ride a bike. See what sort of alternative modes of transport are around that can keep you active without even really trying. I have found that if I can marry both exercise and travel, I’m happiest and healthiest. What about taking a surf lesson? Going on a guided hike into a stunning mountain range? Even just doing a free walking tour. They’re all fun ways to learn more, to see more, to speak to locals who know a ton and are so passionate about their hometown that they want to tell people all about it. All while getting some exercise in.